Canada Wind | Mothers Against Wind Turbines Inc. Adverse Health Effects, Canada Wind, Environment, Unite the Fight! Ontario is playing fast and fancy with recent amendments to the renamed Green Energy Act. It is not the time to be silent. Use your voice and let them know what you think about Grand Fathering existing renewable energy approvals (REA) of industrial wind turbine complexes being built and those operated in our province. provide that, despite its repeal, section 62.0.2 of the Planning Act would continue to apply to specific renewable energy projects in specific circumstances. 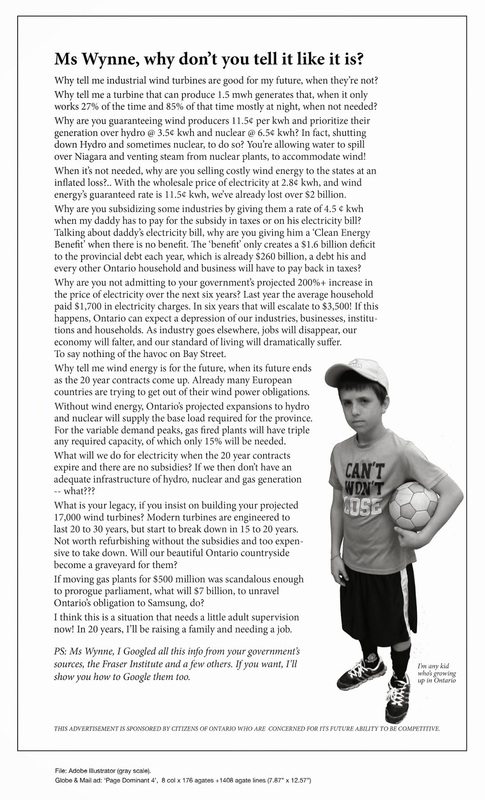 Oppose the recommendation to simply grandfather existing renewable facilities and to protect these projects as they continue to be the cause of adverse health injuries, trespass and havoc across Ontario. Ask the Ministers/Ministry to resolve, to the complainants satisfaction aka the 4500+ complaints and growing provincially. Ask the Ministers/Ministry to address and resolve the water well destruction to the satisfaction of all affected well owners. Advocate fiercely for a health hazard investigation – Please reference Dr Bray’s recent letter Riina_Bray_IWT_Niagara recent and independent researcher Carmen Krogh’s documents. Addition: looks like we have more work to do! Please don’t go silent now! A new paper has just been published. It is open access. GUNTER: Why on earth is Trudeau still so committed to the failing carbon tax? Canada Keep your Hands off Our Pension Dollars! It’s probably nothing. It was just a tweet, after all. But when the federal environment minister, Catherine McKenna, posted her approval of a recent Canada Pension Plan Investment Board decision, it caused a little flutter of alarm among those who follow these things. Ministers of the Crown do not normally comment on CPP investment decisions, approvingly or otherwise, and with good reason. Though the federal and provincial governments set the broad terms of the plan’s operations — how much it collects in “contributions” from employers and employees, etc — the CPPIB, which is responsible for investing the $356 billion accumulated in the CPP Fund, is supposed to operate at arm’s length from all of them. SAY WHAT?! Seriously you cannot make this stuff up and it’s certainly no joke. The Canadian government has been spending our tax dollars on candy cane tainted fluff and it has truly lost its mind. The media world wide has been buzzing (Canada: Santa’s Moving To South Pole Because of Global Warming ) over a recent posting claiming Santa will be relocating to the South Pole as a refugee due to climate change. Who is Horizons Canada? How is it influencing the political climate in the ongoing battle against the lived experience of harms from wind powered facilities? Horizons’ mandate is to identify emerging policy issues and explore policy challenges and opportunities for Canada, as well as to help build foresight literacy and capacity across the Government of Canada. Horizons’ experienced futurists provide expert advice on emerging issues, foresight and scanning through one-on-one discussions, interdepartmental meetings, and facilitated workshops. All engagement requests are discussed collaboratively at the Horizons’ senior management table on a weekly basis. To engage with Horizons, please submit your request to questions@horizons.gc.ca. Policy Horizons Canada is governed by the Deputy Ministers’ Steering Committee. Vision: To promote a high and sustainable quality of life within a globally competitive Canada, through the co-creation and advancement of knowledge that informs and structures policy choices for the Government of Canada by way of an integrated and longer-term perspective. Mission: To provide timely and integrated perspectives on emerging policy issues for the Deputy Minister community by: bridging people, ideas, data, issues and evidence in an open and constructive environment; co-creating knowledge for understanding complex Canadian policy challenges; and experimenting with new tools and methods. Exploring trends and postulating the future, Horizon Canada sees government policies dancing with wind and other renewables such as solar, fueling everything from the grid, to the internet and transportation. Increasing demand for electricity coupled with emerging sources of electricity production and storage could require new (smart, decentralized) approaches to managing the urban power grid. Over the next 10 to 15 years, cities’ power sources may shift to incorporate much higher levels of renewable energy. A growing digital economy powered exclusively by electricity, coupled with a rapid transition from fossil fuel to electric fuel for transportation(link is external) and housing could substantially increase the demand for electricity in urban areas. At the same time, declining costs of decentralized and distributed energy systems could reinforce urban energy security and pave the way for cities to reach their climate change targets. The installation of in-home batteries and renewable energy sources (solar or wind power) on private homes, public buildings and infrastructure facilities (such as warehouses and factories), and the use of vehicle-to-grid technology(link is external) could eliminate concerns over managing peak demand and allow power exchanges between households. This shift may increase pressure on centralized power utility companies to adopt a business model focused on decentralized energy systems with multiple owners. Census of Agriculture recently released by Statistics Canada shines a light on some interesting statistics about renewable installations on Ontario farms. There are 2 465 wind turbines erected in the province as of 2016. “About 10,255 farms have a renewable energy system, Stats Canada reports. Of those farms, about 85 per cent had solar panels and 15.7 per cent had wind turbines. The harsh environment of wind swept Sable Island located off the shores of Nova Scotia famed for its wild horses has claimed the demise of wind turbines. The turbines are coming down. Sharing a place in the history of the island known as a graveyard for hundreds of shipwrecks on the Atlantic. The toll now includes five failed wind turbines. HALIFAX—The harsh conditions and extreme isolation of Sable Island has forced Ottawa to abandon a wind project on the iconic crescent-shaped sandbar — more than 15 years after it launched the initiative. Parks Canada said wind turbines do not meet the needs of the windswept Nova Scotia island, famous for the wild horses that have roamed there since the 18th century. “The wind turbines were part of a … project to reduce Sable Island’s dependence on fossil fuels, and were chosen based on the renewable energy technology that existed at that time,” the department said in an email statement about the million-dollar, overbudget initiative. Dubbed the Graveyard of the Atlantic, some 350 vessels have wrecked on the island’s shores and hidden reefs since the mid-1700s. It is home to hundreds of namesake horses that have become synonymous with its romantic and untamed image. Environment Canada launched the pilot project in 2000 — which would have seen the five wind turbines generate energy onto the grid of the island known for its shifting sand dunes and fragile environment. But when Parks Canada took over management of the 40-kilometre-long island when it became a national park reserve in 2013, the wind turbines were not functioning. “The project faced several delays due to the environmental sensitivity of the site and wildlife concerns, as well as the isolated and harsh conditions,” the department said, adding that the turbines were fully installed and running in 2006.